Zadok Ben-David’s work is filled with trickery and illusion. Firstly, the illusion of a forest in Blackfield looks as though the work has sprung up overnight, when in fact, it took over 60 volunteers and many days of carefully unwrapping and assembling the tiny stainless-steel flowers, plants, and trees that make up the whole. The final number totals somewhere between 20-22,000 individual pieces, representing 900 botanical species from the world over – a truly huge undertaking. “Blossoming into colour”. Zadok Ben-David’s ‘Blackfield’. Photo: Cam Campbell. Standing over the field of miniature, blackened trees gives one a god-like feeling, as one errant step into this tiny landscape would crush whole swathes of it. As I carefully walked around the piece, I was struck by how different perspectives radically altered the landscape. 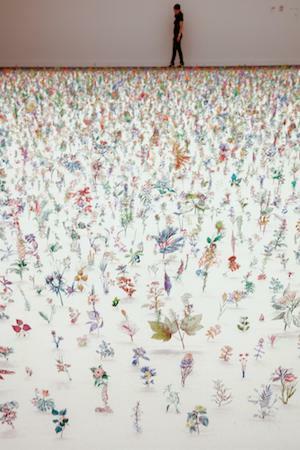 A side-on view of these individual, paper-thin sculptures changed the effect of the whole piece, from a crowded forest to a nearly empty field. I was so distracted by this shift that I almost missed the more obvious and overwhelming transformation as the black sculptures gradually started blossoming into colour, their backs painted in a multitude of different hues. From the other side of the room it was an entirely different view – brimming with wonderment and the joys of biodiversity. Ben-David’s work focuses on human emotion, in this instance, particularly related to the horrors of climate change. He states that his focus is more on the human response to this impending catastrophe than the environment itself, but I couldn’t help but feel that maybe focusing too much on human needs and emotions was what got us into this mess in the first place. I was struck by the field’s spreading renewal and replenishment – like the first shoots of green on a tree ravaged by fire. Why bring the human into this display of nature’s strength, when it’s so astonishing and striking on its own? The second installation, The Other Side of Midnight, is similarly arresting. As I walked into the darkened room, I was unsure what I was looking at – was it a sphere, or a flat, circular object? It was only by walking around the piece that I became certain of its nature – a theme in this exhibition. Ben-David’s love of illusion is brought to the fore in this work. One side of the sphere is painted with colourful images of men with butterfly wings. On the back of the dish, the men have been replaced by swarms of cockroaches, reminding me that, as is commonly believed, cockroaches will be the only thing that survive the apocalypse. The title too, made me think of the end of the world – as the Doomsday Clock ticks closer to midnight, we can’t predict what will happen on the other side. Certainly, we will need a little hope and trickery in the future. ‘Human Nature’ runs at the Lawrence Wilson Art Gallery until April 21. Picture top is the colourful side of ‘The Other Side of Midnight’ by Zadok Ben-David. Photo: Cam Campbell. Miranda Johnson is an arts worker from Perth. She spent the past few years in London working as a record store clerk whilst studying an MA in Contemporary Art Theory at Goldsmiths College. Upon returning to Perth, she has been working for some of Perth’s major contemporary arts institutions, as well as co-directing Moana Project Space, an artist-run initiative. Miranda also sings in indie-pop choir Menagerie and co-hosts Fem Book Club at the Centre for Stories. For the duration of Perth Festival, Miranda is part of its customer service team.